This beautiful stone-built barn conversion was designed and created by current owners Chris and Christine Dye to be their “forever” home. For seven years the couple have enjoyed “the best of both worlds” afforded by the peaceful yet accessible semi-rural setting of the four-bedroomed property, in Chopwell, Gateshead. With one daughter now living abroad, the couple are also expecting the arrival of their first grandchild and have decided to put their labour of love on the market and move closer to family. “Quite frankly, the idea was to stay here forever,” explains Christine. “But our daughter has just moved to America and we feel that the house is too big for us now. “It’s an amazing home and the views are to die for. In the summer it’s fantastic. It really is a lovely house, it’s very warm and it’s very quiet. We just absolutely love it here. The accommodation includes a front entrance, hallway, downstairs cloakroom with toilet, a lovely lounge with stone inglenook fireplace and cast iron stove, conservatory with double doors opening out onto a front patio garden, family room, study and a dining kitchen with ceramic tiled floor and french doors to a courtyard, four bedrooms including the master a guest bedrooms both with en suites, and a family bathroom. 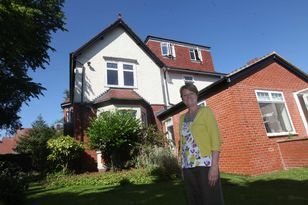 Christine, 59, a sales assistant, and husband Chris, 71, who is retired, spent nine months building the property, which is on the site of a 500-year-old former farm. To the front it has an enclosed and mature patio garden with greenhouse and shed, beautiful views, ample courtyard parking for four cars and an integrated single garage. “At the back of the farm was the barn and we were lucky because we were able to knock it down and build on it as long as we kept the original footprint, so that’s what we did. We built the house in stone to work with the original farm, but designed the new interior to work for us and I’ve loved it since day one. “There’s a lovely front garden and we get the sun all day long, from morning to night. There’s only one other house in view, so it’s completely private and the gardens are all fenced in, so it’s perfect for children and very safe for them. The garden is also very easy to maintain, but it’s ideal for anyone who wants a garden to potter around in. The property is close to Garesfield golf course, local shops and the Metrocentre and A1 Western bypass are both 15 minutes away making it an ideal commuting base while still in the countryside. “It’s in an ideal location for commuting,” says Christine. “I drive to the Metrocentre every day, which is seven miles from here and I’m there in about 20-25 minutes, so it’s very easy. We also have a dog and can be up walking in Chopwell Woods or in the countryside within minutes. And the bus stop is on the doorstep. “It’s stunning, in a wonderful location and has everything you could possibly want from a home. There is very little traffic. You really do have the best of both worlds here. “There’s the Metrocentre and Newcastle city centre within an easy reach and you also have the Derwent Resevoir and lovely countryside walks and drives, and plenty of lovely little coffee shops around too. We love going out for a drive around the resevoir and stop off for a cup of coffee somewhere. The Barn, in West Farm Hall Road, Chopwell, is for sale at a guide price of between £280,000-£299,950, through Reeds Rains, tel: 0191 4883610.